I’m pretty sure we all know the famous online third-person shooter game “Fortnite.” Personally I never got interested, and I don’t plan to either. While everyone is playing Fortnite, I’m here playing a different online third-person shooter called “Splatoon 2.” Now some may know what it is, but if you don’t, you play as a “sapient race of humanoid cephalopods.” Also known as Inklings! And what they do is shoot ink! The main thing this game is known for is that you have to compete with another team to cover the battlefield with more of your ink color. Before I continue with the article explaining what the game has to offer, I’d like to note some things. As you can tell this is called “Splatoon 2”, and not just “Splatoon”, so I will be only talking about the sequel (and that’s because Splatoon 2 is more of a Splatoon 1.5). But, there was paid DLC for the game that basically came out a year after its release that really defines it as “sequel”, but I’ll talk about that in another article. And one more thing, I will not throughly explain why you play as an Inkling, instead of a human. Splatoon 2 was released on the Nintendo Switch on July 21, 2017. So like I briefly explained awhile ago, you play as an Inkling. As an Inkling you can be in either two forms: a humanoid form, or a squid form. In humanoid form, you shoot ink and move like a human, but in squid form, you can swim in your ink and recover ink. In Splatoon 2, you start at Level 1. As you level up, you get access to more weapons, gear, and modes. And the most common way for people to level up at the start is Turf War! 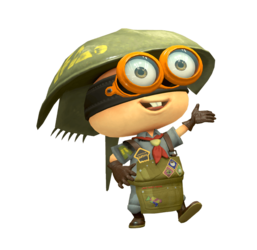 Even though it says this Inkling is at Level 2, disregard that because at Level 1 you’ll still look like this. Turf War is the main gimmick about Splatoon 2. Basically what I described awhile ago, two teams of four Inklings battle out by covering the battlefield with more of their ink color. Now, you can “kill” your opponents (mostly called “splating”), but after you respawn, you can jump right back into the action. Speaking of jumping, you can jump to any teammate at any time of the match to get to areas of the battlefield quicker. The area they are around is not one of the types of battlefields. Once you played enough Turf War, you’ll level up to Level 2! At Level 2, that’s when you can get more weapons. I forgot to mention, but after every match of Turf War, or any other mode that involves 8 players playing, you earn “Coins”, the currency of Splatoon 2. With those Coins, you can purchase gear and weapons. To purchase weapons, you go to Ammo Knights, run by Sheldon. Sheldon is a horseshoe crab. Along with Sheldon, we have Bisk (who runs Shella Fresh, which shells shoes, enjoy my pun), Flow (who runs Headspace, which sell headgear), Jelfonzo (who runs Ye Olde Cloth Shoppe, which sell clothes), and Crusty Sean (who runs the Crust Bucket, which sell food and drinks that help you out in online battles). Now you might be wondering, “Why do I need to buy clothes? Are you telling me that I need to play dress up in this game?” I mean you could, but that’s not the point about them. Each piece of shoes, hats, and clothes come with an “ability.” These abilities help you out in Turf War, and other modes. For example: you might get a shirt with the main ability Ink Recovery Up. With Ink Recovery Up, the amount of time it takes to recover ink when in your ink, will be slightly faster. Also with each piece of gear, comes slots with question marks. Every time you play Turf War, and other modes, a little bar under that piece of gear fills, and when it’s full, a sub ability will be added. The ability you’ll get will be random, but I personally suggest that you try to get sub abilities that are the same as your main ability. Some main abilities can’t be received as sub abilities, so I match with whatever sub abilities. All the abilities without numbers next to them are examples of abilities that can only be main abilities. Now I’ll quickly explain what “weapons” consist of. With each weapon, it comes with a Main Weapon, Sub Weapon, and Special Weapon. The Main Weapon is what you’ll mostly be using when playing. It carries out the basic action of what your weapon can do. The Sub Weapon can be used defensively, help ink the battlefield, even splat an opponent, and etc. Finally the Special Weapon is like the “final, strong finishing blow.” Although you can use it multiple times. Types of Main Weapons on this image: Shooter, Charger, and Roller. Those are all the Sub Weapons. After playing so much Turf War, and improving in the game, another mode will unlock called Ranked Battle (Although technically when you reach Level 10, that’s when you unlock it). Ranked Battle is the “competitive” side of Splatoon 2. In Ranked Battle, you are given one of the four modes to play, which you will not be able to choose. There’s Splat Zones, Tower Control, Rainmaker, and Clam Blitz. Splat Zones is basically Turf War, except you have to keep a specific zone in your ink color for 100 seconds, which there will be a countdown timer for your team that will go down. If the opposing team “captures” the zone (meaning they ink the zone in their ink color), then a penalty will be added to your countdown timer, and the opposing team’s countdown timer will begin. If you recapture the zone, then a penalty will be added to the opposing team’s countdown timer, and your countdown timer will not continue. Instead, you have to get rid of the penalty first, then your countdown timer will continue. The match will end when one of the team’s countdown is at 0, or if 5 minutes pass. The team with the lowest number on the timer will be declared the winner if it goes on for 5 minutes. For all Ranked Modes, they are always for 5 minutes. The second Ranked Mode is Tower Control. Tower Control is riding a tower to its destination on a specific path. It’s destination is always in the opposing team’s base. To make it this mode balanced, they have “checkpoints.” Checkpoints are placed along the path, and you have to wait a couple of seconds to pass through the checkpoint. There’s only 3 checkpoints, and every time you complete one of them, you don’t have to wait on that specific checkpoint again. The final Ranked Mode is called Clam Blitz. On the battlefield, there will be clams lying around everywhere, and you must toss them in the opposing team’s net. You collect them, which you want to turn into a Power Clam. To get a Power Clam, you must collect 10 clams. And with that Power Clam, you toss into the opposing team’s net, but you can’t be sneaky about it because holding a Power Clam will reveal your location to everyone. The opposing team’s net can only be broken by a Power Clam, so once a Power Clam is tossed into the net, you and your team should be chucking all the clams you have at that net while it’s still open. Once the net closes, a penalty will be added to the team’s net number. That number starts out at 100, and you need to get that number to 0. A Power Clam is worth 20 points, and a regular clam is worth 3 points. And if 5 minutes pass without either team’s number reaching 0, whoever has the lowest number wins. This is the last online mode I will be talking about is called Salmon Run. Salmon Run is a basically a Zombie Horde Mode. A team of four Inklings fight threw 3 waves of defeating “Salmonids”, and collecting Golden Eggs, and dropping it in the basket. Salmon Run isn’t always up for playing online, but it’s usually up online every other day. There’s always 4 Main Weapons up for using, and after every wave you use a different one. There’s also 4 Special Weapons you can use, except you stick with the same Special weapon for all 3 waves, and you’re only limited to using it 2 times. Also since there’s no place where you can respawn, they made it where once you get splatted, you can be revived by your teammates shooting at you (ironic right). After 3 waves, you’ll be rewarded with a pay grade increase, along with Cash, ability chunks (those help you with getting specific abilities on gear), food and drink tickets, and Salmon Run exclusive gear. This is the state you’re in when you get splatted. The single player mode is a mode where it’s just single player. Just kidding, there’s more to this mode. You first meet this mysterious lady called Marie. In the first game, Marie was part of a Pop Idol Duo called the Squid Sisters, with her cousin Callie (their names are supposed to sound like “calamari” when mushed together). She tells you that the Inkling’s main source of electricity, called the Great Zapfish, has been “squidnapped” by the Octarian Menace. She then takes you in to become Agent 4 of the New Squidbeak Splatoon. The Single Player Mode gives you a lot of information about the lore of Splatoon. Like how the Splatoon series takes place thousands of years ahead of our current time, and that rising water levels killed us all, so marine creatures began evolving and living up on land. Squids are the ancestors of Inklings, and *insert the plural of octopus* are the ancestors of the Octarians. This lead to Inklings and Octarians having a war about who gets to live on the remaining land. In the end, Inklings won, and the Octarians hold an everlasting grude on the Inklings, so they take their electricity source to have hopes of living in freedom. As you go from level to level in the Single Player Mode, you rescue smaller versions of the Great Zapfish, called Zapfish. Along the way you’ll fight bosses, and discover even more reasons why Marie actually recruited you into the New Squidbeak Splatoon. One more thing I’d like to say is that this mode is supposed to be practice for new players so they can get a feel for the controls, and what weapons are capable of. As I mentioned awhile ago, Callie and Marie were the Pop Idol Duo in the first game. Even though they did music, they were also the ones that announced what battlefields were on for rotation (in the first game, every four hours there would be two different battlefields, but in Splatoon 2, it changed to every two hours. ), which modes are playable, and updates to the game. But, since Marie is busy with the Single Player Mode, a new Pop Idol Duo rose up. And they are called Off the Hook featuring Pearl and Marina! I swear nothing “sexual” is trying to be acknowledged. It’s rated E10+. All the Splatfests so far (for North America). There are additional things for this game, but I didn’t discuss about them because I really don’t use them, but I’ll list them off. There’s a mode called Private Battles, where you play whatever mode you want with any amount of players. And finally there’s The Shoal. It allows Local Play. That’s what the base game of Splatoon 2 has to offer! In my text article, I’ll probably be talking about the paid DLC that came out a year later called: Splatoon 2 Octo Expansion.